Friday May 20 1910 Will did a big churning for me. Then he put in hard work at the yard nearly all day. We put out tomato plants. My feet have hurt me so I did not do more than I could help. I worked at tatting some. Saturday May 21 1910 I did cake baking and other cooking in the afternoon had dinner so Will went to town at 12.12. I had a card from Lizzie. I rested in afternoon. There was a hard rain about 4 oclock. Did evening work. To bed early. 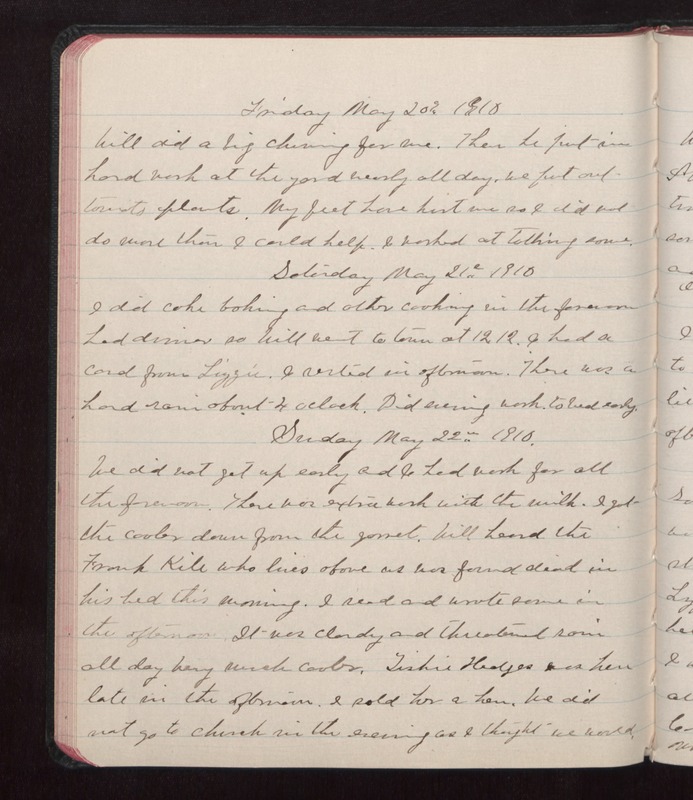 Sunday May 22 1910 We did not get up early and I had work for all the forenoon. There was extra work with the milk. I got the cooler down from the garret. Will heard the Frank Kile who lives about us was found dead in his bed this morning. I read and wrote some in the afternoon. It was cloudy and threatened rain all day being much cooler. Tishie Hedges was here late in the afternoon. I sold her a hen. We did not go to church in the evening as I thought we would.